I'm really late with this blog post, so just the highlights from last week. Race for the finish! I'm the one on the right. I got beat! 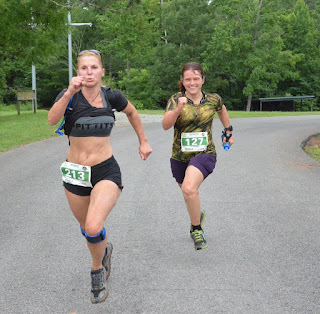 I did a more thorough race recap last week. But as it falls into my training week, this was my tempo run for the week. All of my miles were slower than tempo pace due to being on trail, but were pretty close to tempo effort and heart rate, so I'll take that as a good run. 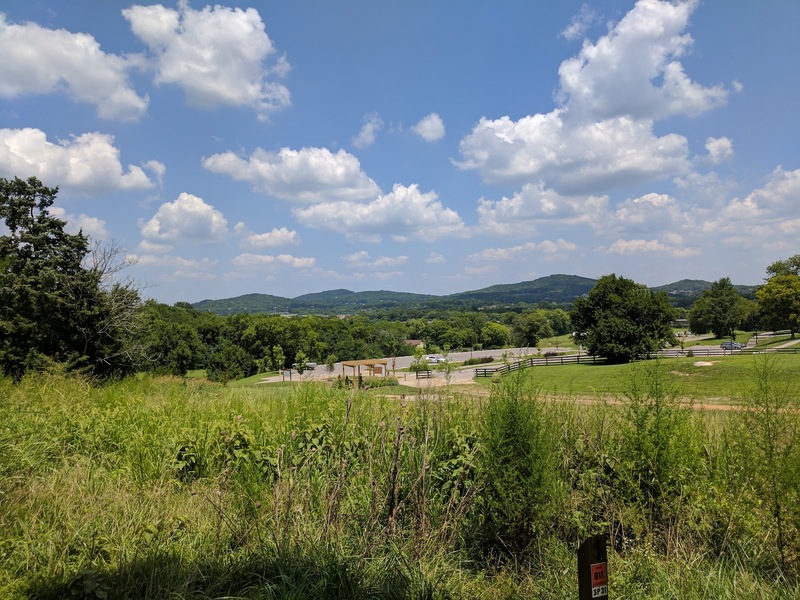 Monday is my normal tempo run day, but since I ran the Bowie 6 Miler, this was an easy day on a hilly trail. I wore a Moving Comfort Fiona bra for the first time. I really like this bra! It fits nicely and no rubs. I think it's time to replace my older sports bras! The only thing I dislike about the bra is that it's a straight strap bra, not a cross in the back. This makes it hard to tuck my bluetooth "necklace" into my bra to keep it still. This was a pretty warm day and an easy effort, so my pace was pretty slow. Great training though. I used the treadmill because I just didn't have time to get out to a trail. I don't really like to run on the road if I can get away with it. So I just hopped on the treadmill as soon as I got up. 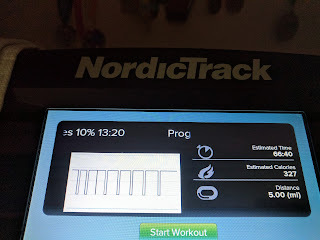 This was my first treadmill workout with my new paces for half marathon training. I ran at a 12:30/mile pace for about 4 minutes, then walked for roughly 45 seconds. Each run/walk interval stayed that ratio, but got longer by 10% until I was running about 3/4 of a mile without a walk break. I like these types of runs on the treadmill because they ease me into the run and keep me from watching the clock and waiting for that next walk break. I used iFit to program my treadmill so it changed pace on its own while I ran and watched Hulu. On a side note, my treadmill shoes are approaching 400 miles of use. I'll retire them to horse shoes when they get there. 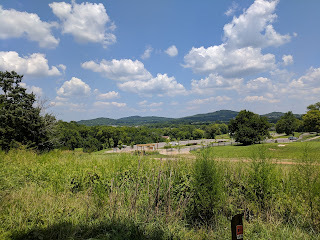 I returned to Bowie, where I'd run the 6 mile trail race, and ran 9 hot, sweaty miles. 91° and 70% humidity! 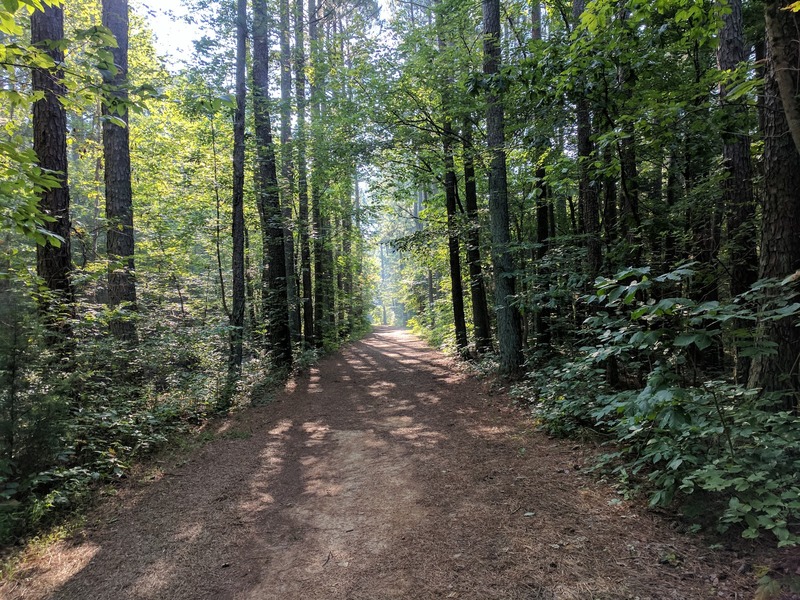 Even though it was a trail run, my long run pace was right on target. I've got a pretty broad pace range for my long runs. 13:00/mi to 14:20/mi. On trail runs, I don't mind if it gets even slower as long as my HR is up there and I keep moving. But I managed 9 miles with a 13:57/mi average pace. I had the mint chocolate GU I picked up at the race and I loved it!! I promptly ordered a box when I got home. I also had a couple of shot bloks at 2 different times during my run. After my run, I usually take a Hammer Fizz tablet in a water bottle, but this time I took a SaltStick capsule and ate an extra strength Tums (for the calcium). I ate grapes and an apple on the way home as well as downing more water. I didn't have a headache for the rest of the day. Sometimes after long, hot runs, I have a headache until I go sleep. So this was a positive thing! Back to the treadmill to save time going to find a place to run. Same workout as Tuesday, I just stopped at 4 miles. This was my first speed workout on the Hansons program. I was supposed to do one last week, but I was resting my foot for the race on Sunday. I went back and forth on what to do this week. All my other runs were the correct runs for the week, as if I hadn't take a couple of extra rest days. But I really wanted to be able to do the entire speed workout, so I chose to do the speed workout I'd skipped. 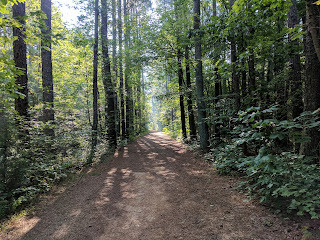 I went out to the Murfreesboro Greenway, a paved running/biking path about 35 minutes from my house. Tempo and Speed runs are mostly going to be done on pavement. The workout was 12 intervals of 1/4 mile at 5k pace and 1/4 mile of recovery jog. 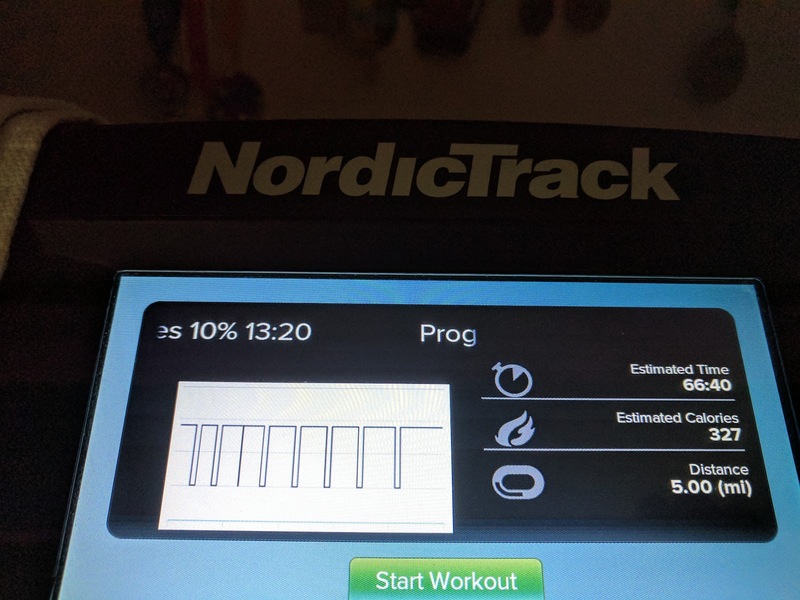 I set up the workout in Garmin Connect and used the app to send the workout to my 935. I started the run with a 1 mile warm up at an easy jog. Then started my intervals. The first 4 or 5 intervals felt fairly easy. I started each interval too fast and had to slow down. 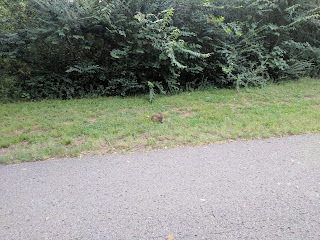 Then it got a little easier to maintain pace without going too fast. Then it got a little harder to maintain pace for the last 2 or 3 intervals. But I did it. Every 1/4 work interval clocked in at 2:42, plus or minus 2 seconds. My recovery jogs included some walking for the first several intervals just so I could adjust some stuff with my gear, but the last half was an easy jog for the intervals. I finished up with another mile cool down. I took a gel during the 4th and 9th interval recovery jogs. I drank about 24 oz of water over the run. Pretty happy with this run. And I was so glad to have it over. It was my last run of the week!